"The Winter Hafla is this Saturday, December 4th, at the old Taylortown general store," says Susan Fontaine about the dance party being produced by the sinuous members of the beladi troupe from Lotus Studio. 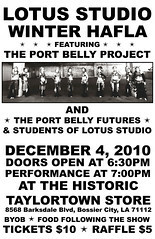 The Port Belly Project will give you a preview of the show you will see if you attend Christmas in the Sky. Doors at 6:30, show at 7. Tickets $10, raffle $5. Door prizes (for the audience) and a raffle (for the dancers) with lots of fun things! "It's BYOB; we'll have tasty food stuffs after the show," adds Fontaine. Some 2,000 guests will motor to Harrah's La Downs on Sat, Dec 11, to see one of the most spectacular parties in the region: the biennial Christmas in the Sky. Harrah's Louisiana Downs will be transformed, says Julia Foley. Beatlemania will envelope the guests from parking lot through 2 floors of super-colorful rooms. 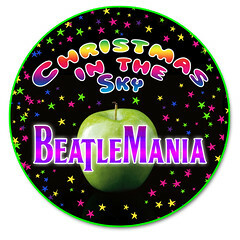 Beatlemania will rock the clock from 7 pm to 3 am. To benefit regional arts activities and artists, Shreveport Regional Arts Council and a large team of volunteers create 16 auction areas, 10 entertainment stages, 12 themed bars, and 11 themed hot and cold buffets. The 2008 event generated a half million dollars to support SRAC programs throughout Northwest Louisiana, says Foley. If you love the arts and an evening of well-dressed sensory overload, call SRAC or get tickets online. They're $250 each. Not to worry: remarks overheard after recent editions of this over-the-top event indicate that the party is worth every dollar to the patron class. Share your vision for Texas Ave - a 9-block area around the Central Fire Station - with Gregory Free and SRAC, says April Dahm. A Listening and Visioning session with Gregory Free will be hosted by the Texas Avenue Community Association on Thu, December 2, 6pm 8pm, at 875 Cotton Street, Church of the Holy Cross Episcopal. Colorful river bottom land suitable for all ages hiking here in the city of Shreveport? It's the Coates Bluff Nature Trail. Access it by parking at Montessori School for Shreveport and walking across Sevier St to follow the tags along the bayouside path. 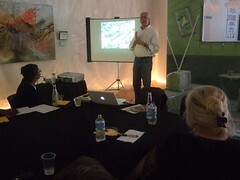 Developed by environmental advocate Jon Soul, the Coates Bluff Nature Trail is a work in its early stages. Still, it is ready for trekking. The first couple of hundred yards are mulched; the remainder is a leaf-strewn, easy to follow woods loop. When it is fully extended, the Coates Bluff Nature Trail will connect three schools: Montessori School for Shreveport, Stoner Elementary and Caddo Magnet High. 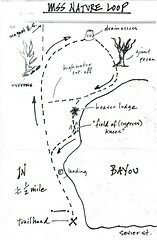 The basis of the trail is the old Bayou Pierre river bed. The trail has been cleaned and cleared by students and adults from Montessori, Stoner neighborhood, Anderson Island neighborhood and members of A Better Shreveport. Rock and roll and fun from a busy guy who will not give up guitars and lyrics and belting both. 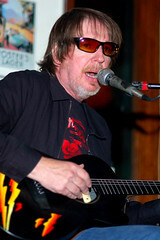 Check out some tunes at Will Maranto.com. If you remember the Rebirth Brass Band from their raucous, revival-tent performance at the Highland Jazz & Blues Fest in 09 you know the power of massed, hard-blowing horns. These fellows will blow down the house. Any question that this is a dance party? And it is an all-ages event. This new dramatization of C.S. Lewis' classic, says director Heather Peak-Hooper, is set in the land of Narnia and faithfully recreates the magic and mystery of Aslan, the great lion, his struggle with the White Witch, and the adventures of four children who inadvertently wander from an old wardrobe into the exciting, never-to-be-forgotten Narnia. 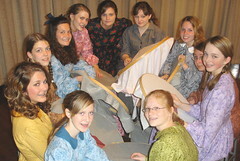 The Academy of Children's Theater, led by Cynthia Whitaker and Lauren Ross, are producers of the show. East Bank Theatre, 630 Barksdale Blvd., Bossier City. Harvey Milk & Billy Graham are co-angels in one composition. In another work the students who died in the Virginia Tech shooting are alive. Chairman Mao wears Mousketeer ears and becomes a sinister buffoon in another painting. These are images from the work of Dr David Holcombe. They are on display upstairs at Meadows Museum of Art, Centenary College. 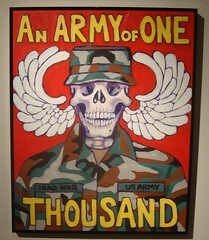 Holcombe is a painter who says he "uses the power of the brush" to probe the art consumers' social conscience. Says Meadows director Diane DuFilho, "'Visions and Visionaries' is comprised of portraits that reflect the myriad social interests of the artist. Many of the subjects are elaborate political cartoons that comment on diverse subjects including gun control, abortion and violence among other social and political issues." Holcombe is a quiet fellow, a physician, life-long painter and collector of art. He has the ability to evoke the issues of the day within canvasses that oscillate upon the wall. His portraits - aided by good signage - are stimulating in every sense and constitute a highly-recommendable exhibit. with the sound of New Orleans street jazz. into participating is the key to the experience. 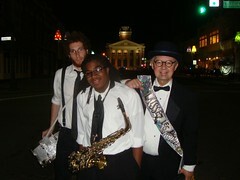 On drum is Jesse Gabriel, one of Shreveport's top young jazz drummers. 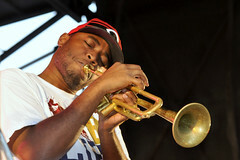 Blowing the sax is Trevarri Huff-Boone, a teen prodigy in jazz melodies. RTSL has performed for Shreveport-Bossier Convention and Tourism Bureau, Artspace and Robinson Film Center and is available to jazz your event in the Shreveport-Bossier area. 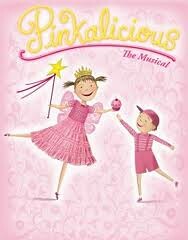 Pinkalicious, on Dec 4, says Robert Darrow. Laura M. Beeman directs and choreographs and William Parsons serves as Musical Director. All performances will be held at the Woman’s Department Club, 802 Margaret Place. Performances: December 4, only, at 11 a.m., 2 p.m., 4:30 p.m., & 7:30 p.m. Pink Princess Cupcake Parties: 10 a.m., 1 p.m., 3:30 p.m., & 6:30 p.m.
Tickets: $5. for performance or $10. for performance & cupcake party. SLT's Box Office is now open for reservations at 300 Ockley Drive (at Youree Drive) in Shreveport, Monday - Friday from noon - 4 p.m. Call: 424-4439. "SRAC is getting a new beginning at the Central Fire Station," notes architect Mischa Farrell. "The project is currently in planning and the team wants input from Artists to make sure this building and SRAC better serve Shreveport's Arts community." "We are having an "Artists Input Session" at Art Space on Tuesday, November 22 from 4PM to 6PM. This may be a great time for artists that have felt distanced to reengage with SRAC and to see what opportunities the new space will bring." in collaboration with the Symphonic Winds of Bossier Parish Community College in concert, Thursday, November 18, 7:30pm, in Anderson Auditorium. 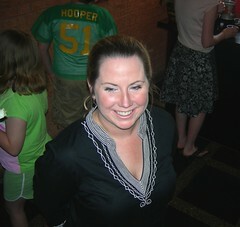 The Green community monthly Mixer is increasing green awareness in Shreveport, says Stephanie Pedro. Energy Star dealers, academia, nonprofits, government, area businesses, elected officials, interest groups, and the public are invited to attend the event. for the attendees. Bring your ideas and business cards; the mixers will be informal, but also informative, in a lively and exciting setting. This event is held on the 1st Thursday of the month at the Holiday Inn Downtown, 1201 Lake St., from 5:30-7pm. The next event will be Thursday, January 6, 2010. THO TWAY - From trash to treasure this child brings new light to what others discard. After being raised part-time in a trash dump of the slums of Mississippi, Tho Tway has taken the aspect of re-used materials and turned them into a mash of mutated dream sequences while leaving his childish visions intact. Most of his works are that of ideas taken from wandering in major cities full of apathy and despair then injecting his own form of chaos. 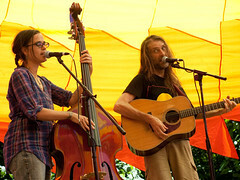 J Bratlie of Dirtfoot writes, "There's a group that we're bringing to town called Truckstop Honeymoon. 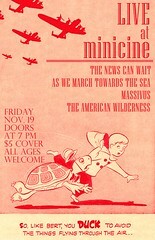 They will be opening the night for us on Nov 20 at The Warehouse. Mike (originally from Australia) and Katy West are a husband and wife team that met in New Orleans, formed their group and eventually fled from Katrina. They ended up in Lawrence KS where their acoustic based music, Banjo/guitar and upright bass, was well appreciated by the Kansas folk." "They set up home, but had one problem with KS: no Mardi Gras. So they put on their own parade on Fat Tuesday down the cold streets of Lawrence, KS, and it has now grown into a real event. We've played a few shows with them and they really are great people. One of our favorite songs of theirs is called Magnolia Tree." 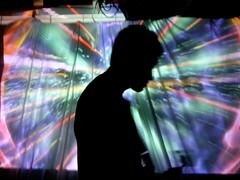 "Join us for an evening of musical and artistic exploration," says Brandon French, "inside the four walls of minicine?. The evening's musical samplings are sure to please as the performers weave a tapestry of sonancy that spans from the ethereal sounds of The American Wilderness, to the thick, powerful doom of Massivus, the crash of sonic waves As We March Towards the Sea, and the high energy of pure rock action with Texas natives The... News Can Wait. A little something for all, the nights performances are sure to be entertaining for any who come. Some bring yourself and your friends." Four designers pursuing their passion for illustration after hours. Featuring the works of Brad Campbell, Travis Eck, Jeremy Johnson and Jeff Welborn @ coolspace @ artspace. "Join others who support good music," says Dr Paul McCarthy, "and good deeds at the Fri, Nov 19, Louisiana Swamp Stomp CD party!" Headlining are singer Carol Fran and piano pounder and singer David Egan, of Lafayette. The venue is the Petroleum Club, from 8 pm - midnight. Tickets are $75 for one person, $125 for a couple, or $500 for your own table of 10 people. The party supports a foundation and an album produced by McCarthy, the founder of the North Louisiana Brain and Spinal Cord Research Foundation. The collection of party tunes, Louisiana Swamp Stomp, features 2 prominent Bayou State musicians who have been affected by brain issues, Carol Fran and Buddy Flett. "Please email us, send a check made out to Northern Louisiana Brain and Spinal Cord Injury Foundation (or simply NLBSCIF), or call (318) 751-5462 for information," adds McCarthy. See more at the foundation web site, called brainhelp.org. TAP visual art teachers showing art at Karpeles in Nov, says Jean Glabus, include Rhonda Glass, Rebecca Bergquist, Gerald Ortego, Thomas Little, Myra Bouquet, Caleb Phillips and Arden Kennedy. Live performances will demonstrate the music of teacher Leon Brown, Lisa Daye and Tai Townsend, adds Glabus. Also performing will be actor-teacher Shawn Dionne. 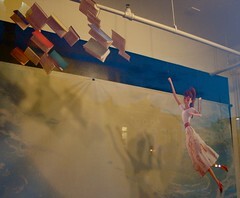 "The Making of… The Fantastic Flying Books of Mr. Morris Lessmore,"
Shreveport Preview of the short film at Robinson Film Center, says Pam Atchison. It's Fri, Nov 12, 6 to 9 pm. Be the first to view the short film at the Robinson Film Center (screenings at 6:30, 7:00, 7:30, 8:00 & 8:30 pm). Sign up for the screening @ artspace. Hear second line jazz music on Texas St as you sashay to the RFC. Come back to artspace for jazz piano, Hurricanes, cash bar and New Orleans nibbles. 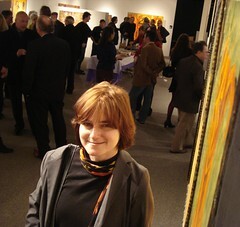 Meet Ellen Soffer, the featured giftspace artist. Park in complimentary parking at the head of Texas Street. 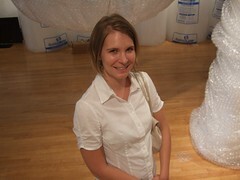 Sneak peek snaps of the exhibition. 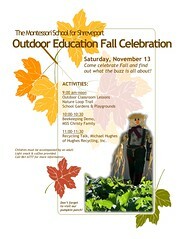 "The one-half mile Coates Bluff Nature Trail will be open as part of the Montessori School for Shreveport's Outdoor Education event," says Jon Soul. "Students will begin using this trail daily as part of their outdoor education at our school. The plan is to extend this trail to Magnet High School and work to gain access for Stoner Hill Elementary and Valencia Rec Center children as well." Soul adds, "The ecological and historical significance of this magnificent area cannot be overstated. Already, A Better Shreveport and other community groups and individuals have played a critical part in reclaiming this urban treasure from years of neglect and abuse. Now you can come grab a trail map and key and enjoy." Sat, Nov 13, 9 am - 11:30 am. See a video with Jon Soul on the Coates Bluff Nature Trail. 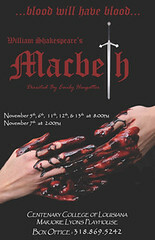 Marjorie Lyons Playhouse will explore how a once good but ambitious man allows this ambition to lead him into a complete descent into human greed, selfishness and destruction in its performance of Macbeth, which continues Nov 11 - 13. "In the story of Macbeth, we see two good people who are blinded by ambition and driven by their love and partnership," director Emily Heugatter said. "Throughout the course of the play, we witness the loss of their humanity through their horrific crimes and the devastating aftermath of their actions." "It's a always challenge to direct a Shakespeare play because they've been around for 400 years and the reason they've survived and are so relevant to us 400 years later is because we deal with very universal primal human emotions," she said. "We're looking at love, greed, rage, envy, lust and ambition. " Scott Gibbs, who plays Macbeth, says "It is an absolutely overwhelming, but at the same time, very satisfying process," he said. The character of Macbeth goes through such a wide journey, he said. "I'm starting out as an innocent man with a small ambition of wanting to rise to power and it's kind of the story of what happens when you give those selfish, ambitious thoughts a chance of actually becoming real." 10 for adults; $8 for senior citizens and military; $5 for non-Centenary students and children under 12. Collage paintings, multimedia paintings and kinetic sculpture from Arless Day, Byron May and Joseph Watts at Gallery Fine Arts Center, Bossier City, says Jennifer Robison. Reception Thurs, Nov 11, 6 to 8 pm. Hors d'oeuvres from Monjunis, which is next door. 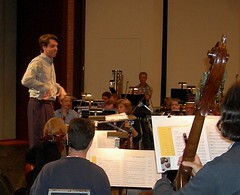 Michael Butterman gives an overview of the concert program. Free and open to the public. Cash bar. Michael Butterman gives an overview of the concert program. Free and open to the public. Cash bar. A pre-concert dinner at Artspace, Shreveport. Call 318.227.8863 for reservations. The Shreveport Symphony Orchestra season opens, writes Michael Butterman, with two of the most iconic works by one of America’s most celebrated composers, Samuel Barber. His Adagio for Strings is one of the most famous works in all of classical music, conveying an unsurpassed depth of emotion. The concert commences at 7:30 pm at Riverview Theater on Sat, Nov 13. Brilliant soprano Mary Wilson then sings a radiant account of Barber’s Knoxville: Summer of 1915. It’s a work dripping with nostalgia and poignant reminiscence. After intermission comes Gustav Mahler’s titanic Symphony No. 1. The renowned composition delivers both intimacy and power in what will be a showcase for the world-class musicians of the Shreveport Symphony Orchestra. Join SSO cellist Paul Christopher for a free pre-concert talk in the hall at 6:30 PM. 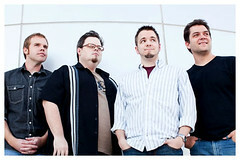 Check out tickets and more at Shreveportsymphony.com. 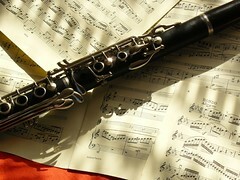 And enjoy music director Michael Butterman's hard work and honors at Michaelbutterman.com. Oakland Cemetery will come to life this week in the All Saints Tour, says Anna Maria Sparke-Keele. The event is from 2 p.m. to 5 p.m. Sunday at the cemetery, Milam Street at Elvis Presley Boulevard, Shreveport. The tour is presented by the Oakland Cemetery Preservation Society. Hines Vaughan is society president. Among the residents you will meet at Oakland via local actors: Mary Bennett Cane, "Mother of Shreveport"; Annie McCune, the famous Shreveport madam; Lt. Leon Marks, Confederate Army officer; and Lt. Eugene Augustus Woodruff, U.S. Army officer and hero of the yellow fever epidemic of 1873. At the same hours the Church of the Holy Cross Episcopal, 875 Cotton St., Shreveport, will present church tours and serve refreshments in the Rose Garden. All Saints Tour, $10 donation, individuals, and $1, children, 12 and under; and free. Information: Anna Maria Sparke Keele, 861-4550, and Holy Cross, 222-3325. 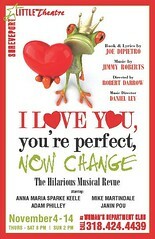 Of his show SLT director Robert Darrow says simply, "get ready to laugh." Three offbeat short romantic comedies by John Guare and David Ives, says Robert Alford, will be staged at the LSUS Black Box Theater. - The Loveliest Afternoon of the Year: Two misfits find romance and solace in Central Park. Featuring: Ariane Fletcher, Audra Caitlyn Moss, Dan Farris, Jenna Glorioso, Joshua Davis, Jamie Norwood, Kelly Mills, Mary Spring and Nick Sewell. 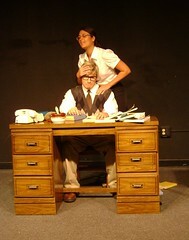 LSUS Black Box Theatre, Bronson Hall Room 111. $10 Educators, Seniors and Military - $10 per person for Groups. All Tickets are General Admission, Seating is Very Limited. Please call 798-4177 or email theatre@lsus.edu to reserve a seat. Presented by LSU Shreveport Continuing Education. 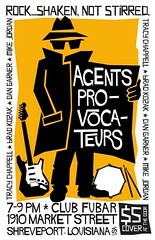 Says raging guitarist and singer Tracy Chappell, "I'll be playing with Agents Provocateurs this Thursday night at Club Fubar from 9:00 - 11:00. I'll be joining Daniel Garner , Mike Jordan and Brad Kozak. This will be the opening of the club at 1910 Market Street. You bring yourself and we'll bring the rock!" Based on watching, listening and jamming experience as well as various videos, the editor can guarantee that patrons will have their tree shaken by this quartet of seasoned rockers. "Join in an alternate universe along the Historic Texas Avenue," says April Dahm. "On the corner of Texas Avenue and Common Street, downtown Shreveport. 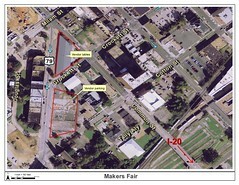 You will find the Maker's Fair under the covered parking garage." "This Saturday is your last chance to check out the Makers Fair this year. Last weekend we had nearly 60 Makers who shared their craft, whether it be clothing, jewelry, bread, hula hoops, Atypical Appalachian music, papaya salad, screen-printing, moustaches on sticks, soap, stationary, coffee, Toomasooba, caramel apples, crochet, felt, wood, metal, glass, belly dance, baby clothes, softies, buddies, rugs, preserves, candles, songs, vintage clothes, shopping bags, photographs, collage, paintings, photo ops, prints, sea shells, tie dye, banjos, pumpkin bread, bird feeders, cupcakes, pottery, guitars, dog treats, beads…"
Info at Maker's Fair Facebook page. At the 25 year reunion of Artists Transit, at Turner Gallery, Centenary College, writes multi-media artiist Tama Nathan, "Bruce Allen and I chatted about the art scene then with The Loft, Artists Transit and Gladstone as working and collaborative spaces for local artists. All of them are now defunct, and there's no equivalent local space at the present time for the younger generation of creative bent." "Is it because money is so tight, rentals too high, or Facebook that replaces the face-to-face synergy of these work spaces?" "The show is an interesting one, with up to date works from many of those artists who were part of the Transit scene," continues Nathan at her blog, Shreveport Images. "What a pleasure it was greeting Carlos Colon, Richard Edwardes, Greg Hornbeak, Dennis O'Bryant, Lewis Kalmbach, Michael Moore, and seeing their innovative, creative spirit in their new works. Works from Michael Herold, Deborah Howard and Robert St. John are also displayed. I specifically remember Deborah's fabulous show, her last local one as she left LSU-S and Shreveport shortly after. I especially enjoyed looking at the original sign in book thats been preserved by Dorothy Hanna Allen...such youthful energy and perspective brought big smiles to my face. Do stop in and enjoy this great reunion." 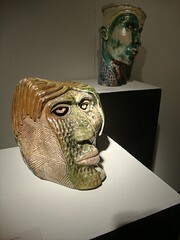 Ceramic works above by Dennis O Bryant. See more at Denoart.com. 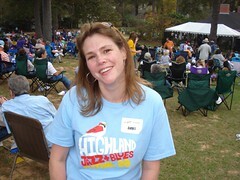 The Highland Jazz & Blues Fest arrives in Columbia Park on Sat, Nov 13. Listen to Centenary College radio, KSCL, as the founder, Amy Loe, and musician/producer Bruce Flett offer an insider's guide to the fest. Hosts are Loren Demerath, Carolyn Manning and Robert Trudeau. The program is Time for A Better Shreveport. Say your piece on this weekly radio show by calling 734-9101 to record your comment - any time of the day or night. Those who enjoy the exchange of ideas and energy are welcome to attend the weekly A Better Shreveport meeting. The meeting is in Centenary Square, 2nd floor of the building across King's Hwy from George's Grill. Call 318-869-5161 if you cannot find the room.